Weston, the head of the country's largest drugstore and grocery chain, said Thursday that pharmacists are well-positioned to dispense the drug in a safe manner. 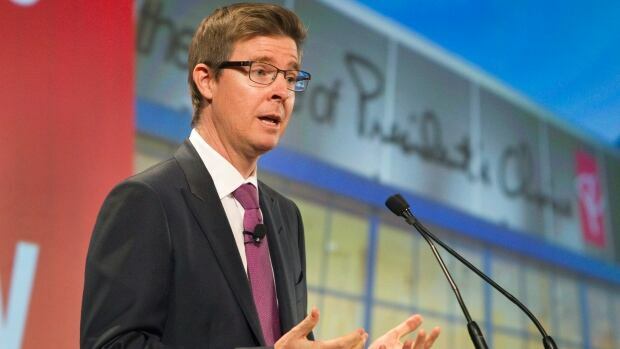 "We're an industry that is extremely effective at managing controlled substances," said Weston, Loblaw's president and executive chairman, following the company's annual general meeting Thursday. "It gives pharmacists the opportunity to work directly in real time with patients as opposed to doing it through the mail, working on their doses and making sure it actually has the therapeutic effect that it is intended to have." Although he doesn't see any "safety or credibility" issues with the current mail system, where patients are sent the drug from a licensed producer, Weston said patients would be able to receive more consultation if the dispensing was done face-to-face. Last month, the professional group updated its stance, saying it had growing concerns over what it calls a "lack of clinical oversight" in the use of medical marijuana if pharmacies don't play a "front-line role" in providing access to the drug. Under Health Canada's rules, patients are only able to buy medical marijuana from licensed producers and are no longer permitted to grow their own, something they were allowed to do prior to 2013. In February, a B.C. court recently struck down the law as unconstitutional. Federal Court Judge Michael Phelan ruled that forcing patients to buy marijuana through the mail from a licensed producer was an "arbitrary and overbroad" violation of patients' charter rights. If Loblaw gets permission to sell medical use, they will also get permission to print money. It is only matter of time when it comes legal to sell recreational. There's a lot of money in that white powder Pop. Treating Tinnitus with Medical Marijuana?